Parathas are welcome anytime,any day at my home. If you have your chapatti dough ready in refrigerator, you can make stuffed parathas in such a short time and there are so many varaitions to the fillings that you can try while making stuffed parathas!! 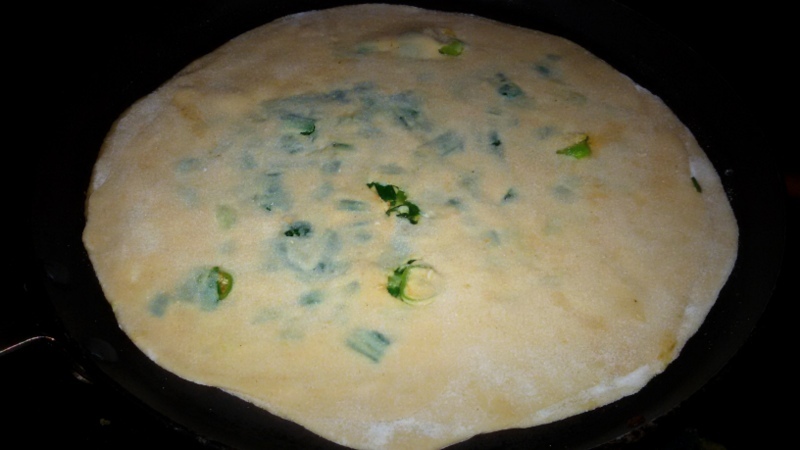 Although we make Palak Parathas & Methi Parathas quite regularly at home, I was wanting to make something different and had bunch of Spring Onion/Scallion at home. So to make it even mor interesting I used generous amout of cheese and made these cheesy, spicey parathas. 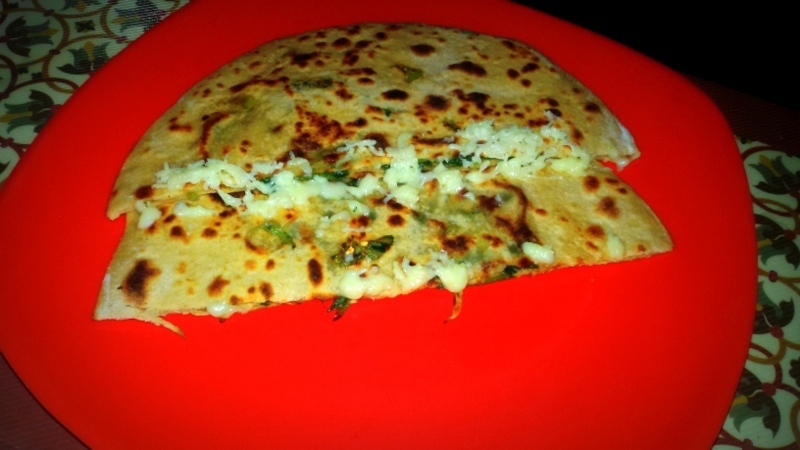 Cheese and spring onion stuffed Parathas are best way to gain strength & energy for busy mornings. 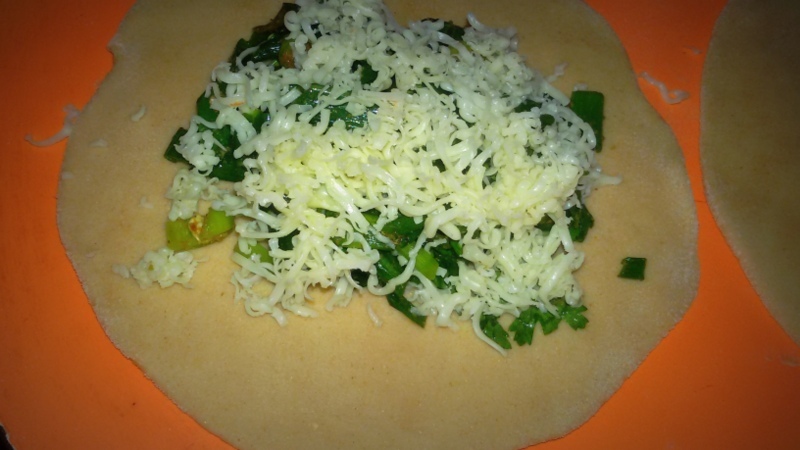 It makes a nourishing and tummy filling breakfast or lunch box recipe. as they have now become a favorite in my family. Simple and easy to make recipe, especially on a busy day. This doesn’t require any side dish. But you can serve it with simple raita / yogurt also. 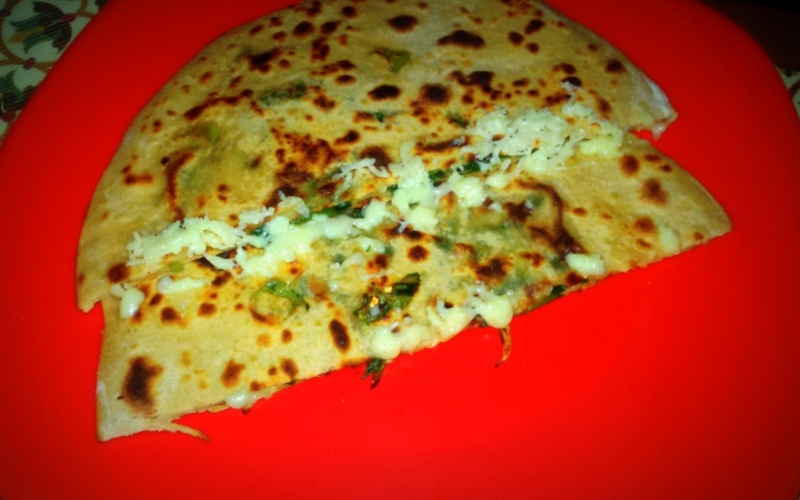 If you are broed of having plain parathas and subzis, try this Cheesy Spring Onion Paratha and enjoy!! 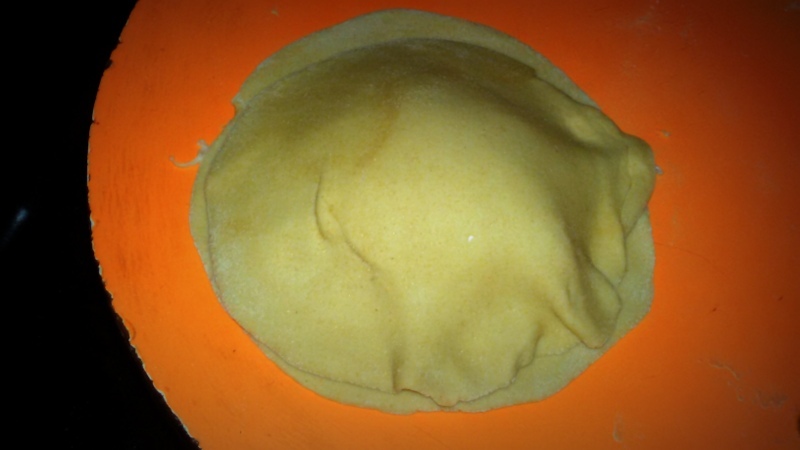 Make regular soft smooth chapathi dough and keep aside. Cover the dough with a bowl and set aside for 30 mins. 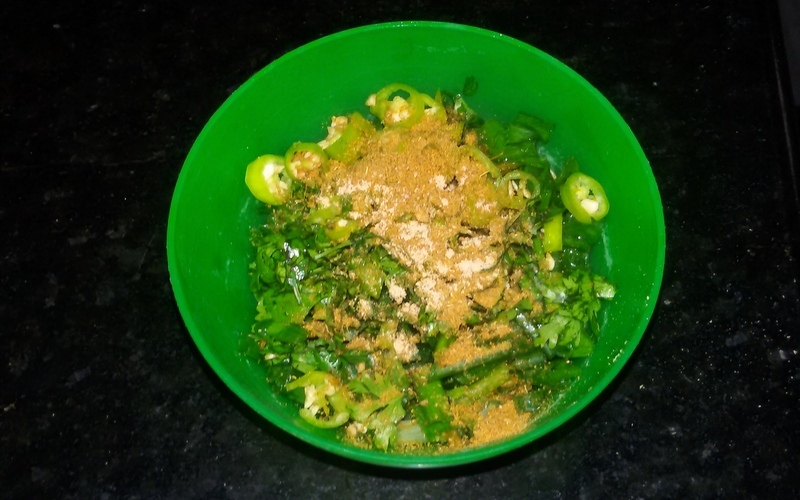 In a bowl mix spring onion, salt, chat masala, chillies in a bowl. Take the dough and divide into equal balls. Take two balls and roll it out lightly. Place one rolled paratha near you, spread some filling over it, add cheese as much as you desire and cover it with other paratha, seal the edges, use a rolling pin to roll the paratha even more. Put the paratha on hot tawa, cook for few minutes, flip over, spread some oil over it, spread again and cook on both sides till golden. 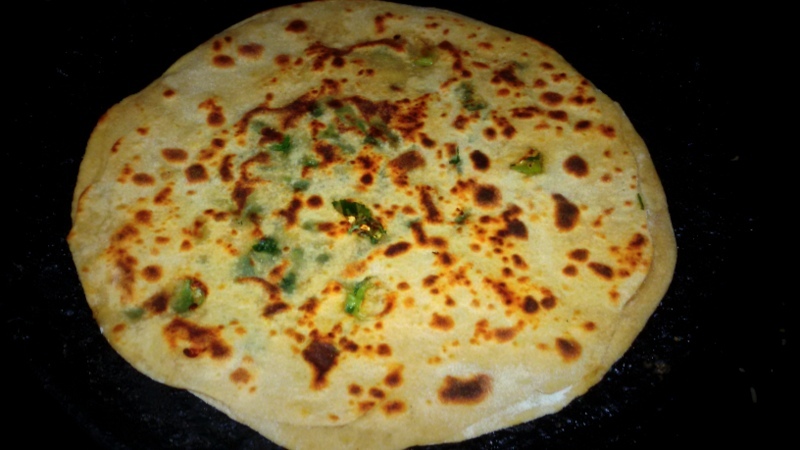 Serve hot parathas, straight off the tava with any pickle or raita!! Even though hyderabadi cuisine has LOTS of non-vegetarian recipes, there are some superb veg delicacies. One of the most popular one is the Qabooli biryani an exquisite, aromatic and flavorful biryani. 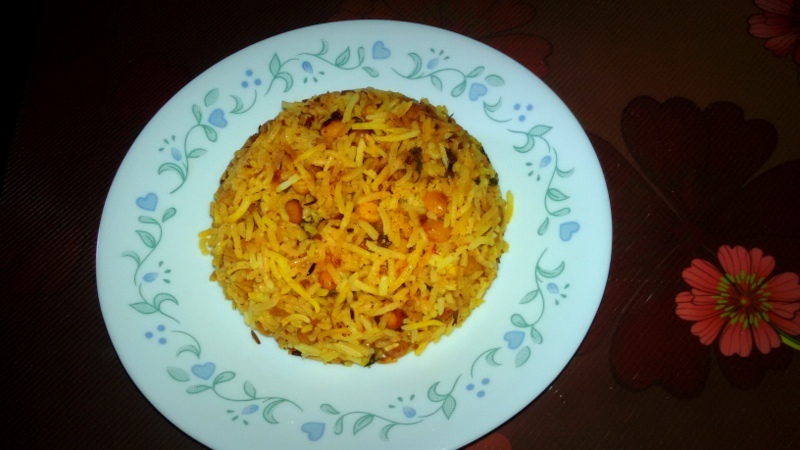 This biryani is made with spicy chana dal and layered with basmati rice and plenty hara masalas….when they all are cooked together in dum, the whole quality of this chana dal biryani changes to a royal feast. I have been planning to make this for very long time and last week I made it for dinner, it turned out quite tasty. Also I love one pot meals, they are so filling and great idea when you have little time for cooking and dont want to be in kitchen for long. This can be served as a main course with a side salad, raita and some papad to munch. Coriander leaves: 2 sprigs and more for garnishing. Lime: Juice of half a lime. 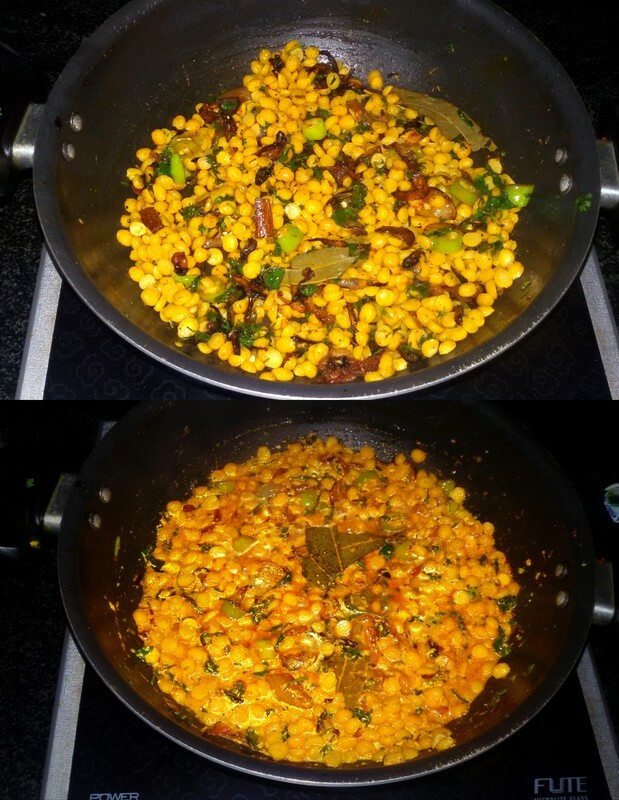 Soak the chana dal and basmati rice separately in plenty of water for 1 hour. Drain.and pressure cook chana dal for 2 whistles. Remember the dal should be just cooked but not soft and mushy. 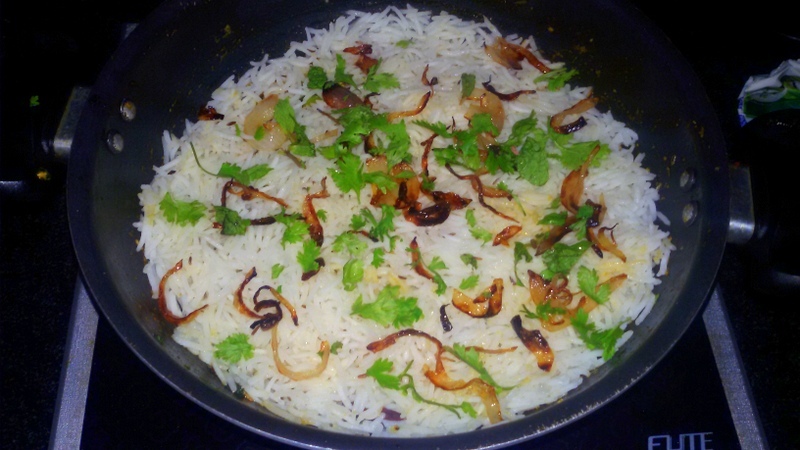 Cook rice with 1 clove, cardamon, 1/2 inch cinnamon,1 bay leaf, salt. Pour some ghee on top and let the rice cook until its 3/4 cooked. 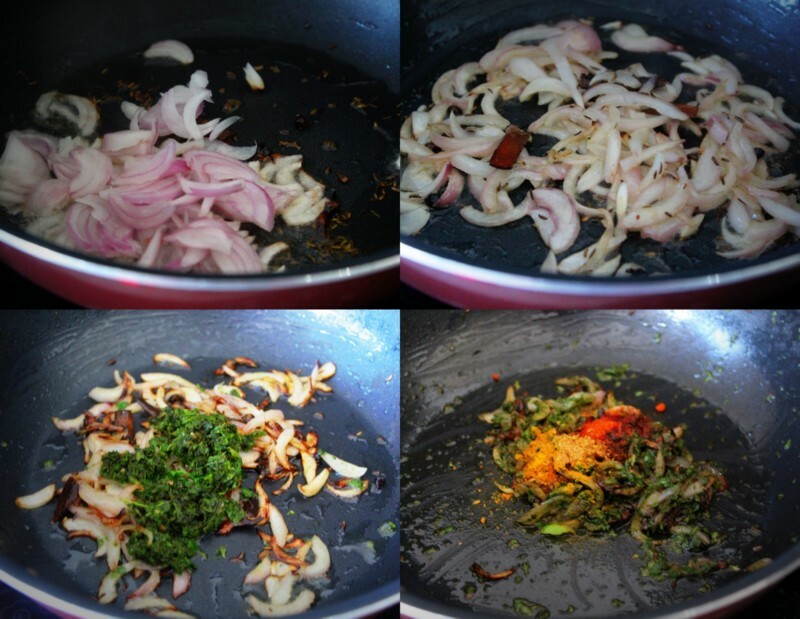 In a kadai add oil and add the remaining above mentioned whole spices. Now add in the sliced onions, let it saute till lightly browned. Meanwhile, grind green chillies, mint and coriander leaves coarsely. Add this masala to the golden brown onions and cook them for a minute. Now add cooked chana dal and add dry masala powders mentioned above with salt and mix everything evenly. Then add curd and cover the lid for couple of minutes. Once you see oil floating on top, add the half cooked rice as first layer and top it up with some more coriander leave and slice of lemon/lemon juice if you want some tanginess. Spread the 2nd layer of the rice. Mix few saffron sticks in milk and spread it over the rice.Cover with lid and let it simmer on low flame for 25 min. Serve with raita and some fresh salad and raita and enjoy! !